In a 9x13 pan, spread the beans in one layer. In a bowl, combine avocados, mayo, a dash of lime juice, and a sprinkle of garlic salt. Mash to combine, then spread over top of bean layer. You can buy pre-made guacamole in the store . . . but don't. Spread sour cream over top of guacamole layer. 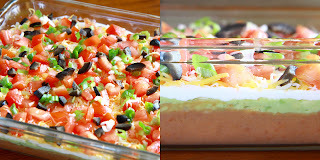 Top with the layer of cheese, then sprinkle tomatoes, onions, and olives. Refrigerate, then serve with tortilla chips. Also a scoop of this makes a great addition to tacos if you don't want to mess with separate toppings.